Xiamen Airlines General Manager Che Shanglun this month announced that the carrier has formally submitted an application to SkyTeam Alliance signalling the carrier’s intention to join the global alliance. The carrier, a subsidiary of China Southern Airlines, has received unanimous approval from the SkyTeam Alliance Council. SkyTeam will now form a project team to work with Xiamen Airlines over the next 12 months to ensure the carrier satisfies all requirements prior to joining. Xiamen Airlines is expected to formally join the alliance in late 2012 to mid-2013. China has been a hotbed for alliance movement in the past 12 months. Also this month, it has been reported that Shenzhen Airlines, a majority-owned subsidiary of Air China, is expected to join Air China in the Star Alliance in early Jul-2011. Shenzhen Airlines has already entered into codeshare agreements with several Star Alliance members including All Nippon Airways and Asiana Airlines. SkyTeam has the largest presence in China, with a 21% capacity share, due to China Southern Airlines’ membership (the carrier joined the alliance in Nov-2007). This capacity share will increase further, when China Eastern Airlines joins the alliance this year, along with subsidiary Shanghai Airlines - a former Star Alliance member - with its presence further boosted when Xiamen Airlines joins next year. 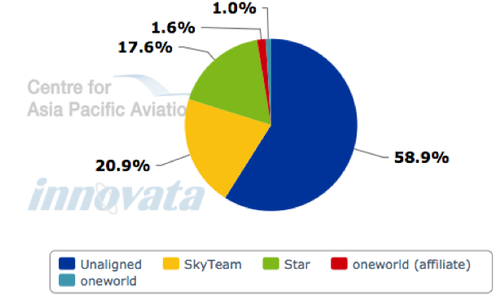 Star Alliance, meanwhile, has a 17.6% capacity share, due to Air China’s membership. oneworld has a very small presence in the mainland market, but has a strong presence in Hong Kong due to Cathay Pacific’s membership. China’s fourth largest airline, Hainan Airlines, remains unaligned, but confirmed to The Global Times back in Jun-2010, that it is pursuing a global alliance membership to reinforce its position. "The company has considered joining one alliance for a long time. Joining the alliance is a double-edged sword, but the opportunities in an alliance outweigh the challenges. It is just like joining the WTO - we enjoy rights and obligations at the same time,” the carrier’s public relations manager Lu Feng stated. It is widely speculated that Hainan will join oneworld, the only alliance without a mainland partner. It has been speculated that Cathay Pacific Airways, which competes with Hainan Airlines subsidiary, Hong Kong Airlines, in the Hong Kong market, could be Hainan's sponsor if the Haikou-based carrier reached a future membership agreement. Hainan held negotiations with oneworld in 2006, but the talks failed owing to the carrier's weak profitability at the time. In other recent developments, Xiamen Airlines last month entered into an aircraft acquisition agreement with Boeing to purchase six B787 aircraft. The aircraft will be delivered in stages from 2014 to 2015 and will be used to launch services to Europe and the US from its Xiamen base and Fuzhou. The aircraft will increase the ATKs of the group by 3.5% from levels at 31-Dec-2010 and will be funded partly by internal resources and partly by financing arrangements with commercial banking institutions. Xiamen Airlines stated the order is consistent with the development strategy and the aircraft fleet structure plan of the group and will facilitate the optimisation of the fleet and capacity, "thus enhancing the competitiveness and core competence of the Group". 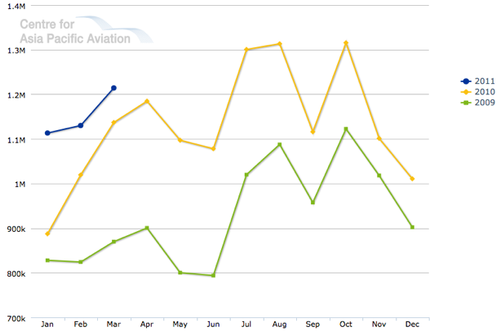 Xiamen Airlines now operates a fleet of 70 aircraft, according to Ascend data. The carrier, which has taken delivery of three aircraft so far this year, is scheduled to receive a total of nine aircraft in 2011, with the carrier to take delivery of four aircraft over Jul-2011 and Aug-2011. The carrier plans to double capacity in the 12th Five-Year Plan with its fleet to grow to 130 aircraft. 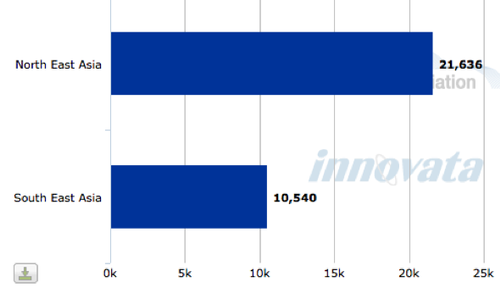 Xiamen Airlines reported revenues of CNY3186 million (USD483 million) in the three months to Mar-2011 (1Q2011), a 29.9% year-on-year increase, as reported by Carnoc.com. Passenger revenues increased 24.4% to CNY2970 million (USD450 million). Passenger numbers increased 13.6% to 3.5 million in the quarter. 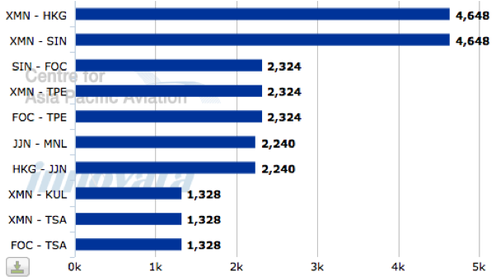 Xiamen Airlines achieved record revenue and profit in 2010, the carrier’s 24th consecutive year of profitability. Operating revenue reached USD10,680 million (USD1618 million) and it generated profits of CNY1550 million (USD234.8 million) during the year. The carrier reported CNY13.0 billion in assets at the end of 2010 and General Manager Che Shanglun added the carrier’s debt ratio has been reduced to below 70%, due to strong 2010 results and recent capital base enlargement. Cargo volume: More than 300,000 tonnes p/a. This will involve an average capacity growth rate of 14.9% p/a over the next five years, with the carrier seeking to increase its domestic market share to 6% by 2015. At present, Xiamen Airlines operates to five international destinations in Northeast and Southeast Asia, with services to Hong Kong, Singapore, Taipei Taoyuan and Song Shan, Manila and Kuala Lumpur. 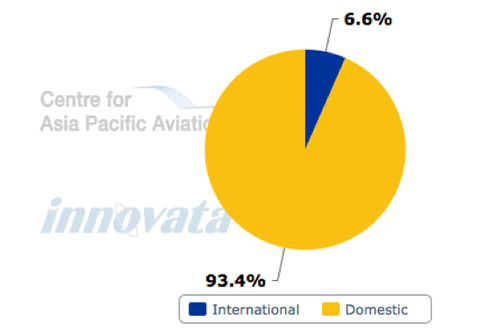 International services remain a small part of the carrier’s operations, with less than 7% of capacity deployed internationally. Xiamen Airlines has five branch companies and eight operating bases.